Finally sorted through the whack o' UFO reports I received this week. More than 100 cases from 2011 (not including the ones I had already received from earlier this year), including 43 from August alone. These have come from Vike, Sightings, UFOINFO, PsiCan, DND, and Ufology Research. Still, that's a loooong way from a record. We had 128 cases in August 2008. So what you're hearing about "record numbers of UFOs" and "massive UFO fleets" doesn't match what we're actually seeing. I know that MUFON has seen a big jump in online case reports, but it's difficult to say what that's attributable to. In Canada, at least, numbers of UFO reports are high, but not at record levels. 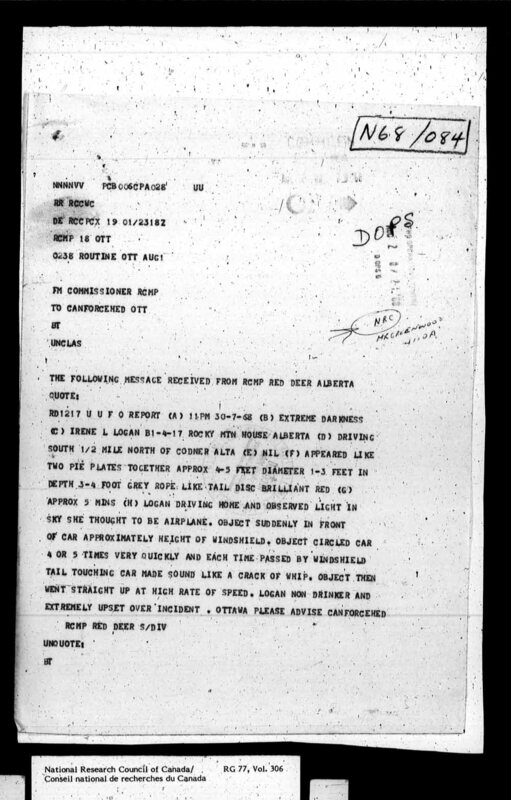 Going through the thousands of old Canadian UFO documents now available online (but not suddenly released through any "Disclosure," unlike what you may read on some sensationalist UFO websites), you can find some gems. On July 30, 1968, while driving near Codner, Alberta, 51-year-old Irene Logan reported to the RCMP that at about 11:00 pm, she had seen a light in the sky that she thought was an airplane. Suddenly, the object zoomed up to her car and hovered in front of her car's windshield. It was a brilliant red in colour and looked like "two pie plates together," about four or five feet in diameter and about one to three feet from top to bottom. It also had a "3-4 feet grey rope-like tail." That's not the weird part. The object then "circled [the] car 4 or 5 times very quickly and each time passed by windshield, [its] tail touching car made sound like crack of whip." The object then "went straight up at high rate of speed." The recording officer then noted: "Logan non-drinker and extremely upset over incident." Which is likely an understatement. The report was sent to the Commissioner's office of the RCMP by the Red Deer RCMP office, with the note: "Ottawa, Please Advise CANFORCEHED." Apparently, the RCMP Commissioner's Office did just that, because the teletype online is from "Commissioner RCMP" to "CANFORCEHED OTT." And that's it. No additional documentation or investigation. Why that is significant is that other cases in the files contain extensive documentation, often running many pages, but usually only when they have an explanation or are shown to be hoaxes. Did they just assume that she was crazy? For those who asked, here's a summary of some of the UFOs reported in Canada in 2011. One of the big buzzwords in ufology these days is "Disclosure," with a capital "D." It's something that in my opinion, by the current definition, certainly won't happen, but many UFO buffs are persistent in their belief that the "Government" (with a capital "G") will release all of its UFO-related secrets due to public pressure and lobbying by exopolitics types. Second, if there's something really juicy, it'll continue being withheld. We still don't know anything about Black Projects that the US Congress approves every year to the tune of billions of dollars. Third, we've seen what has been released already by the USA (e.g. Blue Book) and many other countries, most recently in another batch put online by the MoD in Britain. And it's mostly junk. A few cases of note, but nothing really interesting. We already have thousands of pages of official UFO docs accessible by anyone who wants them, so the amount of material awaiting "Disclosure" is comparatively small. Case in point: Canada. In my last post, I reported on Isaac Koi's discovery of how to access thousands of Canadian UFO docs in one fell swoop. Several down people have been grabbing them and sifting through them for something - anything - of interest. Since we had access to most of these docs already in paper format through personal visits to the National Archives in Ottawa, we knew what to expect. Lots of correspondence between departments and with members of the public asking for info on UFOs, with the usual standard responses. I find the docs curious for several reasons. The contents of a consecutively-numbered small batch of files sometimes contains cases and correspondence from non-consecutive years. One from 1952, then 1968, then 1964, etc. Why? Also, there are examples where we have a memo describing a particular document supposedly attached, but no attachment. The cases that we do find are fairly unspectacular; many fireballs and "bright lights with tails" crashing to the earth - which are also fireballs. 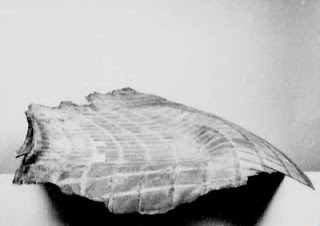 But speaking of crashes, remember the Clan Lake case, where an object was seen to fall into a lake in the NWT in 1960? That generated about ten pages of docs, total. In addition, the RCAF and RCMP made a lacklustre attempt to retrieve the object over the course of a few years, then lost interest. But only two years later, in 1962, two separate well-witnessed crashes of objects into northern BC resulted in major recovery operations involving helicopters, ground searches, witness interrogations and a full-bore investigations with dozens of pages of documentation. A metal "nose cone" from something was even found and taken for analyses. All are of historical interest and have been marked accordingly. Not surprisingly, the letter from Kanon requesting the information does not accompany this memo. 1. UFO reports are of historical interest. This could mean that they are of cultural significance and should be documented and preserved. Furthermore, such reports might well be part of our Canadian heritage and might be studied with funds from government sources, like other heritage topics. 2. The reasons UFO reports are not made public is because some are official RCMP documents, which makes sense, and because others are private correspondence from citizens who request anonymity, which also makes sense. Except for one thing: hardly anyone who reported a UFO to the NRC or RCMP actually requested anonymity in their letters or reports. The case files don't contain witnesses' comments to this effect. Diligent researcher Isaac Koi has published on his blog some details about some unusual space debris that was found in northern Saskatchewan in 1968. It was the largest piece ever found to that date, and was definitely considered to have come from space. However, the Canadian military and government could not definitively explain what it was from. Koi got the docs and photos from a collection of UFO-related material held by the Canadian National Archives and made available online. I have noted before that this is not "Disclosure" because the Canadian government has been making UFO docs available for decades at the Archives in Ottawa. It's only recently that they scanned several thousand docs and put them online. Anyway, I replied to Koi in Errol Bruce-Knapp's UFO Updates and noted the found space debris was one of a number of known, documented crashes of objects in Canada. Few people know that there was another U-2 incident other than that of Francis Gary Powers. It's a good thing that Flin Flon was more friendly than Russia. As far as we know, no one saw the U-2 make the emergency landing in Saskatchewan, which might have resulted in a UFO report. An object is seen to fall into Clan Lake, Northwest Territories. Called "Canada's Roswell," it's actually a bit better because we have official docs that something really happened, unlike Roswell. Fragments of a "space vehicle" found near Wollaston Lake in Saskatchewan are received by the NRC. Koi notes that this chunk of metal was the largest such debris found to that date, and yet it still didn't make it into any list of known space debris recoveries. This radioactive Russian spacecraft was seen to fragment and fall over a very wide area in the largely uninhabited Canadian north. Still, radioactive debris was painstakingly tracked, located and taken to the Whiteshell Nuclear Research Establishment in Pinawa, Manitoba, for examination. Aboriginal people throughout the area were given medical examinations and tested for radioactive contamination. The significance of the above events is that each has official documentation and was investigated by authorities. The U-2 was technically not a crash or a UFO incident, but it's interesting it took place in a region where other events are now know to have occurred. Largely uninhabited, what else might have happened in the Canadian north that is yet to be discovered? Peter Davenport, PSICAN and YouTube all came up with a new batch of UFO reports recently. These, plus those that came directly to me or Ufology Research, all contribute to a new list of recent Canadian UFOs. More Chinese lanterns were reported as UFOs. While on vacation, I had many opportunities to sit back and get some reading done. There's nothing better than sitting on a deck by the water and reading a book while the sun is setting. And first thing in the morning. And after a nap. And under a tree looking out over a field. So what do ufologists read for relaxation? Well, a lot of it is about UFOs, not surprisingly, but there's an interesting mixture of things to stimulate the mind, but some stuff just to read for its mush value. Like Hybrids by Whitley Strieber. I didn't get it. Yes it's a thriller, and yes, it's kind of about aliens, although the alien presence is a carryover from previous storylines. They helped a mad scientist create several kinds of superhuman cyborgs that war with one another. So I went looking for his other book that came out this year, The Key, which actually is an expansion of his writings about an apparent contact experience a decade ago. The book illustrates the fundamental problem with contactee literature: it's literally unbelievable. Strieber feels that an ultraterrestrial visited him in a Montreal hotel room and imparted to him deep and mystical knowledge. This, despite the fact his notes on what the being told him show nothing but vagueness and confabulation. e.g. Strieber asks: "Was there a Eucharist before Christ?" The Key (Being) replies: "I don't want to answer." Strieber asks: "Why are universes created?" The Key replies: "Being serves joy." WTF? At an SF convention, I picked up The Real UFO Invasion by Ray Palmer (1967), one of the few UFO genre paperbacks I didn't have yet in my collection. In Wisconsin, I picked up Why We Are Here! by Gloria Lee (1959), or rather, as it notes on the cover: "written by a BEING from JUPITER and instrumented by GLORIA LEE." It reads very similar to Strieber's Key. e.g. "We of the solar system wish only to lend our hand so you can proceed into the new vibration of your Golden Age." In fact, the messages are almost identical. For lighter fare, I picked up two early juvenile lit books: The Boy Aviators' Treasure Quest by Captain Wilbur Lawton (1910) and The Radio Boys and the Sending Station by Allen Chapman (1922). These are fun reads, predating series like om Swift and the Hardy Boys, and were their originators of the genre. A surprise find was Crop Circles of Wessex, edited by Jane Drake (1997), which I purchased for only a buck. It has articles by Kent Goodman and Pat Delgado, and a foreward by Reg Presley. My two favourite books of the summer reads were quite unexpected. First, Zen and the Art of Writing by Ray Bradbury (1992). It's a small paperback that is mostly reprints of earlier works, in which Bradbury describes his philosophy and offers practical ways of honing the craft (art) of writing. He gives some amazing insight, and imparts some serious wisdom. Probably the best book about writing that I've seen. And finally, UFO in Her Eyes by Xiaolu Guo (2010). Okay, so I got it for the title, but I was pleasantly surprised that it really has not much to do with UFOs at all, but is a sad romance set against the political landscape of rural China. Written as a series of letters and reports to government officials, it's a delightful book and may become one of my top 10 favourite reads of all time!